Inventory We are a resale marketplace, not a box office or venue. Ticket prices may exceed face value. This site is not owned by Volvo Cars Stadium . The Volvo Cars Stadium is located in the North Eastern part of Charleston, South Carolina on Daniels Island. With convenient access thanks to Interstate 526 the location is easy to get to for people in Mt. Pleasant and North Charleston as well. Hootie and Blowfish played to a record crowd in 2005 and since then many great musical acts have played there including Zac Brown Band, Dave Matthews and many more. 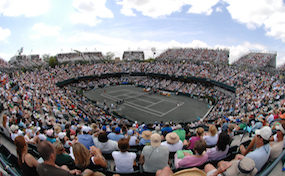 Volvo Cars Stadium is a tennis first facility boasting a notorious clay court and seating for 10,000. In 2017 Jimmy Buffett will play a concert to what will presumably be a sold out crowd. VolvoCar.StadiumCharleston.com is not currently affiliated with any official website, box office, and or primary venue. We are an independently owned and operated company that deals exclusively with the online sales of tickets in the secondary market. Prices on our sites may be well below or above face value and can change quickly with demand. To order tickets for all Volvo Car Stadium Charleston events please follow the steps online through the checkout or call our operators at anytime.